grandma's cookie jar: just for fun - Make Your Own Games for Free! 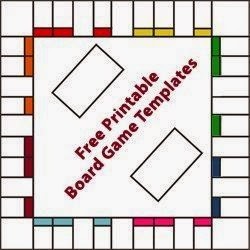 I was browsing on Pinterest this morning and found a great link where you can download and print your own game boards! I thought this would be great fun as my grandsons - especially Josiah - love to play board games, so making our own version of Monopoly or Candy Land or one of the other games provided sounds like great fun! Just follow this link and you'll find free templates for Monopoly - you can fill in the names of the spaces however you like (I think it would be fun to designate them for family members and add in photos to make it really unique! ), Candy Land, Monopoly, Sorry , Chutes and Ladders and more! What do you think? Which game would your grandchildren enjoy making and playing the most? Enjoy!